HISTORIC REVIEW OF THE FORMATION OF THE PROVINCE OF LOS SANTOS. The Province of Los Santos was created in 1850, by the Congress of New Granada, with the old cantons of Los Santos, Parita and the district of Santa María that belonged to the old Province of Panama. This new province was called Province of Azuero which capital is the city of Los Santos. In 1855, the province was eliminated, and the Constituent Assembly of the Federal State of Panama formed the Department of Herrera with Pesé as county seat. In 1864, it was changed the name of Herrera by Los Santos and the county seat was transfer to the city thus named. In the year of 1915 the Law No.17 of January 18 th was given, in which the Province of Los Santos remained reduced to the Districts of Las Tablas, Los Santos, Guararé, Macaracas, Pocrí, Pedasí and Tonosí; with county seat in Las Tablas. The City of Las Tablas presents, by means of its crafts and the making works by the inhabitants of the place, a rich city in traditions and Panamanian culture. This is a region rich in songs of “décimas, the dances, etc. Its population is composed by racially mixed and native groups. CITY OF LAS TABLAS : Las Tablas City is the capital of the Province of Los Santos and it is located in a beautiful plain to 12 kilometers approximately of the coast of the Pacific. It has a port named Mensabé. It is difficult to know with accuracy about the foundation of this city, but the tradition indicates that it was founded by the Marine Captain named Jacinto Barahona approximately July 19 th, 1671. In 1721, the Church of Santa Librada was already built, national monument nowadays. One of the attractions of the city is in the Museum Belisario Porras. This museum is dedicated to the memory of the Dr. Belisario Porras, three times president of the Republic of Panama. The museum was founded in 1959 and can be contacted through the phone number (507) 994-6326. The Province of Los Santos offers you a great opportunity to carry out diverse sports in different places as we detail further down. Besides you can carry out ecological tourism visiting places as the important solid one (mountain) of Canajagua that has an altitude of 985 meters and the Western Chain of the Peninsula of Azuero, that finishes in the hill Cambutal, with an altitude of 700 meters. This province possesses impressive beaches, where is you can take vacations and to live unforgettable experiences. 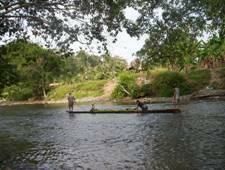 Taking a homemade canoe down river on the Azuero Peninsula. There are many specatacular rivers that run down the Azuero Peninsula and empty into the Pacific Ocean. These rivers help keep the Azuero peninsula nourished and supply plenty of water to the people. Typical beach on the Azuero Peninsula. Pedasi and Pocri offer beaches just like this one. Notice the pristine white sandy beaches and the clear water. Beach front property in Pedasi has gained attention for its investment opportunity. Ocean Real Estate on the Azuero Peninsula is no longer a secret. Don’t miss out on your chance to own a piece of Panama, the Azuero Peninsula, and a home on a beach in Pedasi or Pocri. Refugio de Vida Silvestre Pablo Barrios – Pedasí. Refugio de Vida Silvestre Isla de Cañas – Tonosí. Here is a historic museum located on the Azuero Peninsula in the town of Las Tablas. There are several things to do when visiting Panama’s Pacific Coast. There is fishing, sight seeing, relaxing on the best beaches in Panama, and taking a trip to Isla Iguana or Iguana Island. The House of the Culture - INAC. 2-DISTRICTS THAT FORM THE PROVINCE OF LOS SANTOS. Descendents from “Kunas”, “Chocoes” and “Guaimíes” in Pedasí. 3.4-TURIST AND HISTORIC ATTRACTIONS OF THE PROVINCE OF LOS SANTOS. The national historic monuments of the province of Los Santos . The santeña church [ Los Santos Church] dedicated to the adoration of Saint Athanasius is found located beside of the old main square of the place, today park Simón Bolívar. The architectural characteristics that are found in the ecclesiastical building present different dates, for which is deduced that the construction of the building and of its altarpieces of wood carved must have done for phases. Thus the altar dedicated to the dedication of Maria Immaculate has recorded the year 1721. The “santeña” church [ Los Santos Church] has a documentary rich heritage contented in its parish records that date from the first part of the 18th century whose study would point out the process of construction of the building, but unfortunately the access to them is blocked due to dispositions of the priest of the place. The church of Saint Librada of Las Tablas : The church of Saint Librada continues in its architectural conception, the provincial style of the colonial churches of our country. The building has three naves and rectangular plan, a presbytery in the subsequent part, an extensive sacristy with two vain of access to the same one. The main altarpiece, of polychrome wood carved, and golden, originally is the liturgical piece of greater historic meaning that has the church of Saint Librada of Las Tablas currently.